Varieties in the Printmaking of Joan Miró | Skinner Inc.
Joan Miró is best known as a painter of Surrealistic figures that dance across flat surfaces like alien cartoon creatures searching for a party. Wise collectors know that he was also a skilled and prolific printmaker, working in lithography and intaglio techniques for much of his career. He began experimenting with printmaking in the 1920s, but it wasn’t until later in life that he pursued it vigorously. Like many artists, Miró had particular themes and subjects which reoccurred throughout his career. He repeatedly returned to Alfred Jarry’s character Ubu Roi. The Barcelona Series, published in 1944, was a group of 50 lithographs created as the artist’s response to the Spanish Civil War. Ubu Roi is the central character here, but the suite was really a thinly veiled rebuke of General Francisco Franco and his cohorts. 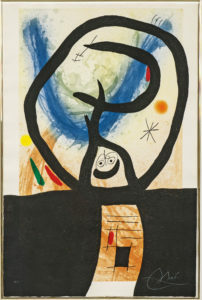 In 1966 Miró returned to the subject, this time creating illustrations for a published version of Jarry’s play (see lot 75). 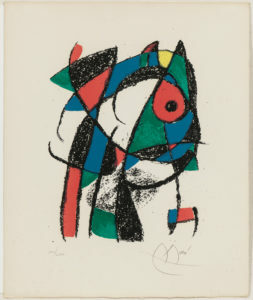 Always methodical – a trait not necessarily anticipated in an artist devoted to Surrealism – Miró worked directly with his printers and publishers to develop catalogues raisonne of his prints, going so far as to create original lithographs to illustrate the six volume catalogue of his lithographs, as seen in lot 82, an image created for the second volume. His most coveted and experimental prints are the large-scale intaglios which feature his use of carborundum. Carborundum or silicon carbide has been manufactured as an abrasive since 1893. In printmaking, carborundum was considered an experimental technique and is used in two primary ways. The printing plate can be abraided with carborundum. The result of this creates a dark area with some texture. Artists using this method often then work these areas of their plates, much in the way an artist might do in creating a mezzotint. Alternatively, a paste of carborundum powder and binder can be applied and hardened on the surface of the plate. Because the artist generally brushes this paste onto the plate, the texture can be made quite thick and can even imitate brushstrokes. Both techniques can result in deeply saturated areas of color which are heavily textured, but this is especially true of the latter approach. These images have a tactile, three-dimensional quality rarely seen in printmaking. The texture reads somewhat like embossing but is infinitely more fluid in both form and depth of the textures created. In 1967 Miró met printer Robert Dutrou, who had printed works with some of the great 20th century print publishers including Crommelynck and Maeght. 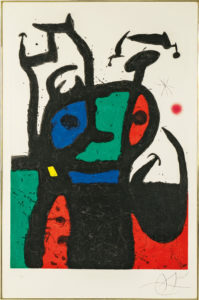 Dutrou was more than happy to share the technique with Miró, and the latter produced a series of carborundum prints over the next three years that are still considered amongst his strongest printed work. Miró’s La fronde (lot 76) and Le matador (lot 77), both from 1969, exemplify Miró’s breadth with the method. In La fronde Miró uses the carborundum only with black ink and thus creating a dramatic contrast between the luscious, coarsely textured areas and the more colors created with aquatint and etching. Le matador takes the use of carborundum to its printmaking extreme, creating a surface equivalent to the thick, heavy impasto sometimes seen in oil painting. The breadth and variety of Miró’s prints are a boon to art lovers and collectors. Collectors can enjoy buying original Miró prints even at relatively modest prices, and all of us can appreciate his experimentalism and whimsy. 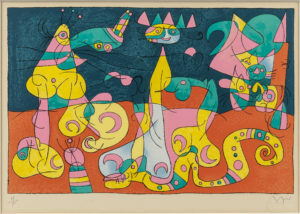 The prints mentioned, along with other works by Joan Miró will be offered in the upcoming American & European Works of Art auction on September 21. This entry was posted in Blog and tagged art prints, Fine Prints, Joan Miro, lithograph, print auction, print making by Robin Starr. Bookmark the permalink.